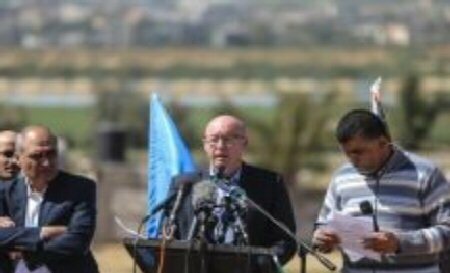 Supplies of emergency fuel, provided by the UN for critical facilities in Gaza, are fast being depleted, the Humanitarian Coordinator of OCHA, Mr. Jamie McGoldrick, warned on Sunday. In a statement, McGoldrick called on Israel to end restrictions preventing the import of fuel, and for donors to provide immediate funding for emergency fuel, currently set to run out in early August. According to the World Health Organization (WHO), Al Quds Hospital, which provides life-saving medical interventions for 150,000 people per year, including major surgeries, deliveries and intensive care will be forced to shut down in coming days, due to lack of fuel, with another four hospitals likely to run out within the next three days, thus significantly reducing provision of essential medical services to the population in Gaza, McGoldrick pointed out. Elective surgeries are being further reduced. Over 7,000 elective surgeries have been postponed, in recent months, due to mass trauma casualties and low resources available to cope with the demand. At highest risk, currently, are over 2,000 patients in Gaza’s hospitals, who rely on electrical devices, including neonates in incubators. Over 1.27 million people will be directly affected by the closure of the hospitals and reduction in provision of vital health interventions. Additionally, the reduced functioning of water and sanitation facilities risks an increase of waterborne disease and outbreaks. At present, water and sanitation facilities are rationing available fuel supplies, which will be exhausted by the end of July, if fuel imports do not resume. In addition to further reductions in water supplies, this would also potentially lead to sewerage overflowing into inhabited areas, entailing grave public health risks. Funding for emergency fuel will run out for all critical facilities in early August, with US $4.5 million required to cover fuel supplies through the end of the year. Since 16 July, Israeli authorities have prohibited the entry of fuel into the Gaza Strip, in the context of tightened import and export restrictions, reportedly in response to the launching of incendiary kites from Gaza into Israel. According to OCHA, an average of 950,000 liters is distributed by the UN, each month, to around 220 critical hospitals and health clinics; water and sewage treatment sites; and solid waste collection services. The deliveries ensure that a minimum level of life-saving services can be maintained in the midst of the dire electricity shortage facing the Gaza Strip. At present, the nearly two million Palestinian residents of Gaza, over half of whom are children, receive electricity for no more than four hours each day. Over 60 percent of the emergency fuel is consumed by some 50 health facilities.